Apart from holidays, there are sure to be times when you need to stay overnight somewhere with your dog in tow. Never expect to turn up at a hotel, guesthouse or motel and be allowed to book a room if you have a dog. Unfortunately the UK is no longer a dog friendly place and any trips involving pets need to be planned well in advance of leaving home. At the height of the summer there are many major dog shows around the country. Exhibitors will travel from one to the other – sometimes competing at five or six shows in a fortnight. Staying at campsites on or near the show ground you will soon get to meet and make friends with fellow exhibitors. Many hotels and guesthouses are happy to take well-behaved dogs. Those hotels that don’t accept pets have normally had a bad experience in the past. Please don’t become one of these dog owners that spoil things for other dog owners. If you are staying in a guesthouse before entering a dog show do not groom the dog in the room, do it before you leave home or at the show. You will find that other residents will be interested in your dog and want to know if you won. This is an ideal situation to promote your breed and dog ownership. If you are looking for a place to stay; first read the weekly and monthly canine publications. There are always advertisements for dog friendly places to stay – many very near to the show grounds. There are also paperback publications on sale in newsagents and bookstores for different types of holiday accommodation in the UK. These books are planned to show the differing requirements of prospective travellers – one symbol which is always used is the ‘dogs welcome’ sign. Speak to fellow exhibitors, quite often they will be able to give details of suitable accommodation in the area of the dog show. Most dog show schedules will have a section for local hotels, guesthouses and campsites. These will book up quickly so as soon as you know you will be attending the show, book your room as well. Even the most well behaved dog can leave a few stray dog hairs and the room may have an odour of ‘dog’ especially on a wet day. Carry a king sized bed sheet that can be draped over the bed on you arrival to protect it from the dog – and do not encourage the dog to climb onto the furniture. Ensuite bathrooms are attractive to the dogs, as there is a supply of water (the toilet) and enticing things to play with such as the toilet tissue hanging from the wall! So keep lids down and paper tucked away – dismantle the toilet roll if it is too much of an interest for your dog. Never leave the dog alone in a hotel room while you go out to eat. The dog may damage the furniture, make a mess and howl and whine, as he will be alone in a strange place. 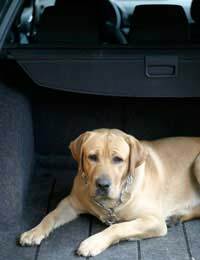 If it is too hot to leave your dog in the car find a pub with a garden, well-behaved dogs are normally welcome and you can all dine together. Failing that a fish and chip supper in the car will keep all the travellers happy! Ideally you should take your dog’s food with you when travelling. You may not be able to purchase his usual meals at your destination. Now, this is fine if your dog’s diet consists of tinned or processed foods, it’s a little trickier if you are an exponent of the raw meat diet or a vegetarian diet. Weigh out each day’s food into plastic sandwich bags and pack enough for the trip along with a travel proof bowl.If you rely on buying food at your destination or sharing your own food with your dog you may live to regret it when his digestive system is upset! Keep a convenient water carrier with you; the ideal holder is an empty fizzy pop bottle. This can be refilled enroute at service stations and cafes. Rather than use your normal water bowl purchase a plastic bowl with a snap on lip. These are perfect to keep water at hand in the car, as they do not spill even when driving over bumpy roads. These can be purchased from most pet stores or mail order – see the adverts in most canine publications. If you are travelling during the major holiday season remember to book your ferry place well in advance. Also check that pets can travel on the ferry. It may be that they have to stay on a certain deck or in the car area – be sure of the details in advance. When attending a dog show why not stay over for a few days and see the surrounding area. With major dog shows in Wales, Scotland, the West Country and Ireland you will be able to enjoy all that the UK has to offer without ever boarding a plane! With a little forward planning you will soon begin to enjoy not only attending far afield dog shows but seeing the countryside of the UK as well.